Antiques challenge. Duelling auctioneers Charles Hanson and Raj Bisram travel through Dorset and Somerset before heading for an auction in Bridgwater. 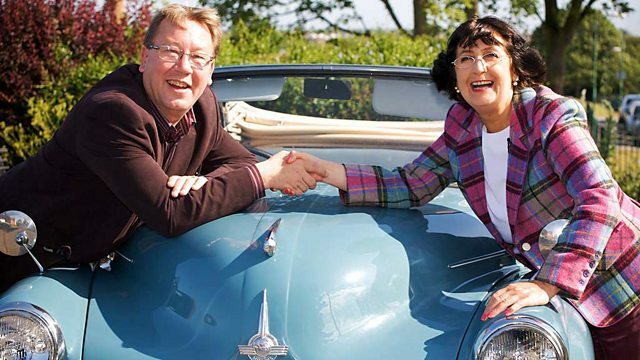 This is the Antiques Roadtrip. Today, our well-read experts are on the road to a literary destination. Dorchester. It's Thomas Hardy country. I actually studied Hardy at school in English literature. -is all set in and around the Dorchester area. the only way really is Wessex. Ha! You're not bad yourself either. and a runaway Roadtrip champion. has already managed to double it, with £411.04 to spend today. But it's not all about profit. There is the car to think of too. -Shall we give it a name? -Bella is a perfect name for our car. -Which means hi in Italian. around 900 miles later, in Crewkerne in Somerset. and head west towards an auction in Somerset, at Bridgwater. he is also desperate to beat Charles. So the antique centre it is. Relax. You don't have to park the bus. Just park next to it. Always a good idea, that. -I've been here before, haven't I? -Nice big place you've got here. -Is this all fresh stuff? Well, whatever takes your fancy. There is a lovely little pot lid on the bottom shelf down here. "St James' Clipper Ship - Sovereign of the Seas." It could be new, it could be 1980s. it could be ripe for auction. -I just wonder, you've got a little pot lid over here. I wonder how much it is. The best on it is 32. -I'll be with you in a sec. Would you mind? Thanks a lot. And this would probably be from the 1960s. The other thing I liked was this fork here. Almost what appears to be a bread fork, or perhaps a toasting fork. -It almost looks to be like 17th century. -You find some really odd pieces made in bone. You never know quite what they are for. The ticket price is ten pounds. What could it be, five pounds? -No, I think it's worth a little bit more than that. Would you do the group for six pounds? Call it seven and I will shake your hand. Well, I'm off and running. Now, where has that Raj got to? -I keep being drawn to this area. -There is a few things. A nice little nest of drawers. They are either called collectors' drawers or spice drawers. This one is late 19th century. They are very, very useful. it looks like it might even be an apothecary one. Are we way too off? Yeah, it's not quite enough, is it? -we could then renegotiate with them? -We can have a go. Yeah, we can have a go. There are a few things down here. -There is the three antique brass spoons. -These three, I quite like those. -They are a bit different. -And also, I quite like the Dalton beaker. I was just checking to see if the rim is silver. And it looks like it is. So that would be one, two, three different lots in this section. OK, so ticket price would be 175, 36 on the spoons, 59 on the beaker. All right, leave it with me and let me see what I can do for you. It looks like he's about to spend a serious amount of money. Mainly so he can get his mitts on those drawers. The three pieces - 150. Very best I could do, I'm afraid. Can I ask you to go back to them one more time then, OK? 150 and will they throw that in as well? -Yeah. The wooden ball as well. It's very rustic. I can see this in a Somerset farmhouse, full of fruit. -It's got £22 on it. Hang on, chaps. Look who's here. Yeah, give them a moment, Charles. I think a deal is in sight at last. Give me another fiver and we're done. 155. -We got there, thank you. He's being spied on, and he knows it. Are we agreed on £350? -I've spent all my money. If I don't make £1,000 on this, I should give up my job. He's just spent 360. I don't know what on. But that's one, you know, mean spend. That's frightening. -You know, sometimes when you eavesdrop, it doesn't pay off. Now it's his turn in that corner. Anything left? Goodness me, there is some really good things over here. I love these early sticks. is the fact that they will date to around 1760.
is that tactile quality of handling something that is 250 years old. And we haven't got the one, we've got the pair. pair of mid-18th-century gilded brass candlesticks for £30. How much could they be for the pair? £30. We could probably squeeze to 25, Charles. They are really nice. Yeah. I think they are charming. You wouldn't do 20, would you? -Go on, why not. The sun is shining today. Tell me, Martin. This big wooden dish here, has it got some age? I don't think it's got a massive amount of age. Oh, dear. Come on, Martin, speak up. It's sold, Charles, unfortunately. You've just missed out on it. Oh, no! Charles, I'd like to step in here at this point. Who bought it? I love it. Did you really buy it? -Make an offer, make an offer. -I'll make a small profit on it. Yeah, let's get out of here. £27 in total, sir. But that's enough shopping for a while. on the Isle of Portland. Look at that view! Wow! tip of Dorset, to visit the disused Old Higher Lighthouse. -How do I get up? Crikey. It's a bit steep. -Pleased to meet you. Do have a seat. -What an amazing landscape you have. reason that Marie Stopes - a leading paleobotanist - came here in 1923.
work in a different field. Family planning. How did she get into the whole subject of birth control? so many children that were unplanned. And she was very keen to alter that. So she went into contraception. She gained popularity, in the first instance, with the books she wrote. She wanted them to be cheap so the poorest people could buy them. until, of course, the Catholic Church got involved. They didn't like what she was doing one little bit. reflected her belief that there should be equality in marriage. and were soon reprinted several times. Emotion came into it. Caring came into it. -How to look after your partner. -That's an interesting title, isn't it? But what's so amazing is the fact that she herself was so naive. Her first marriage was never consummated and she had it annulled. just this overwhelming desire to help women with huge families. Stopes opened Britain's very first family planning clinic in 1921.
the London clinic offered free advice on contraception. what contraception was there in the Victorian times? Back in Egyptian times, there was natural sponge. That would have been used. Lemon juice. Balloons, children's balloons. All manner of strange things. which opened in the '30s and '40s, against sizeable opposition. defeat at the lengthy libel trial to protect her reputation. She spent every penny defending this right. It didn't work against her. -Because the women realised that there was something there for them. And they just flocked to the clinics. soon rediscovered her love of palaeontology. And then she decided that the island should have its own museum. -Avis's Cottage, because it's in Thomas Hardy's book. It was a lovely museum. For the size of the island, it's fantastic. -No, a couple of miles. -Can I give you a ride? -Will I freeze to death? Let's go to this museum. several of the artefacts here, including a megalosaurus toe bone. Knowing a bit about antiques of course, we know of Portland stone. And I can see around me now some wonderful carved Portland stone. Even the floor we are standing on. Obviously, through the quarrying, a lot of the fossils got exposed. You've gotten the ammonites, there is a nice one down there. people what they were actually sitting on. has never made any headlines or anything. -It's always been the birth control. because she was a pioneer in this as well. Yeah, what an amazing lady she was. And what an amazing legacy she left Portland. right next to Chesil Beach, Raj is still combing. -I'm Raj. And you are? -I'm Pete. Pleased to meet you. -Nice little shop you've got here. Pete has certainly got quite a collection crammed in here. Although it's hard to see beyond the Triumph and the Beezer. -That's a lovely old Triumph, isn't it? -Yeah, it's a 1958 3TA. -There is a problem with the clutch at the moment. Which I just haven't had time to look at. -But, yeah, the engine does run. but how much would something like that go for? In this sort of condition, you are looking around about the 2,000 mark. I've seen something else. A pinball machine. Ah, Charlie's Angels, bless 'em. I'm sure they would be big in Bridgwater. -How much have you got on it? -On that one, I've got 350 on it. -That's not a bad price. But I need something with a nice big profit in it. Point me in the right direction. What have you got? We've got a lovely old garden plough here. Fantastic. What's the best on it, Pete? I should think, is about 35. Not much of a gardener, I fear. -I keep looking at that sign. -Yeah. Is it a heavy one? -No, it's not heavy. But it is original. 30. I can't do masses off it, but I can certainly do it for 25. My fear is on this, Pete, it's too gone. The paintwork here is very, very flaky. are always usually in good condition. Yes, yeah, but in this condition, you can see it is original. I think, for the moment, I'm just going to put it down, if that's OK.
What's he got down there? This is a 19th-century mahogany writing slope. And it's something that is incredibly out of fashion today. Hm. But it's in not bad condition. It's got a little bit of veneer missing on the front here. £30 Pete's got on it. It's about what it's worth. you know, there might be a small profit. What's the best you can do on it? -Oh! You're a hard man, aren't you? 25. I was hoping you were going to say more like 15. You know what I'm going to say now. -You're going to say 20, aren't you? but nowhere near enough for me to catch up. Another flying start for the new boy. Now, time to get back to Bella, the Herald. and it almost feels like sitting on a towel. Today's lesson is in history. In what year did Brian Clough take over Derby County? I think it was 19... Oh, dear. 1967, actually. Know your answers, Raj. a writing slope and some spice drawers for £173. Leaving almost £200 in his wallet. and some bone implements for £27. So he still has just shy of £400 to spend today. What year was the French Revolution? Later, they will be making for an auction in Somerset, at Bridgwater. But their next stop is back in Dorchester. -Just by the front door. Thanks a lot. -Have a great day's buying. In your own time, Charles. I can't open the door, Raj. -There we go. I'm out! -Hello, sir. How are you? So, John, what I'm looking for are things which are market fresh. -I'm hoping I can be first on. -We've just had a new lot come in. -Yeah, we cleared a big attic. Lots and lots of boxes that haven't been touched since '52. -Tell me they're not wrapped in 1952 paper? -So nobody has seen it. Not for the last 50 years. That news has definitely perked him up. There we go. It's a bit cheeky. I wonder how long it'll take him to pick up the scent. That's a really good box. It says "Sorrento. Souvenir." you may have picked up this box. What puts me off is the fact we've got this split here. But it is 120 years old. Is it priced? Yes, it is. £50. Could be a mental note for later. Right up his street. As is that. armour at the armoury in Leeds. This is quite similar, but, of course, it's later. This is probably mid-20th century. But it's decorative. -And it's complete. And I might just give John a quick call. John. May I just have a quick word with you? Tell me about your treasure. I don't really know much about it, if you want the truth. -It came out of an attic. It was in a big box. -Hold on. From that attic? It's complete with what appears to be a bit of an ashtray sword. Tell me, John, does much more come with this? -Just those leggings over there. -Can I just bring them over? -Did this all come from the same? -Yeah, yeah. All from the same. Goodness me! Aren't they wonderful! Could the mannequin come with the lot as well, John? Can I ask you how much it could be? -As it's you, 40 quid. an offer if I get a bundle of bits and pieces together. performing well, it's collectors' sections. And the market also is particularly strong for fountain pens. This one is a vintage Conway Stewart pen of the 1950s. A bit plain. quality for the decades they represent. and metallic oxide fountain pen here. Which is beautifully mounted there with a 14 carat gold nib. John, tell me, these fountain pens, where do they come from? -Look at me, how much? -Why did I say that?! £40. £40! OK. Highly excited. Is there still more? Goodness me, John. This is a dirty buckle. I'll test you. It was made three years before Queen Victoria died. Now, who was paying attention earlier? -Often we call these nurses. It's quite a masculine buckle. More for a man, isn't it, really? -Would your wife wear that? -Probably. Although she is very feminine. -I'm pleased to hear it. And the best price on that, John, would be how much? Blimey, if he buys all this, it will match Raj's efforts yesterday. which is the forerunner to the record player. Within these rolls here, you've got records which can be played. He, John. I've just seen this Edison Standard phonograph. -It is missing its horn, isn't it? and 99% perspiration was responsible for thousands of patents. Including this one in 1877. Now, when did Victoria die? That lifts up like that. Look at that! Look at that. -Look at the handle inside. -Under there. Oh, yes, yes, yes! -Obviously, John, the rolls would come with the phonograph. -How much could it be? -I could do it for less. -Could you? What's the best price on that? -OK, so what's the plan then, Charles? and it's a great statement piece for a saleroom. I do like the pens I saw earlier on. I like the buckle. I like the phonograph. I like the box. I like everything. Come on, Hanson, play it safe. But at the same time, go wild. and paper out and then we can do some maths. Time for Charles to have a turn. Getting better. A bit more? -Oh, don't! Ah! You wouldn't meet me halfway at 160, would you? So, he got them all. And now has the tricky task of sorting them into lots. where the courage of six farm workers changed the world. met under the ancient sycamore to form a union. They just didn't know how to survive. Trade unions were lawful. Had just been made lawful. And that was the way forward. But we'd have to do it secretly. If the employer found out too soon, he could pick us off. So they took an oath of solidarity, of secrecy with one another. George Loveless was the main character. taught himself to read and write, clearly a clever man, good speaker. And he has been seen as the leader of this union. It must have been a movement throughout the village. even though only six were arrested. put an end to the Friendly Society of Agricultural Labourers. an obscure act designed to combat naval mutinies might be invoked. he could arrest them, and that's what happened. They were arrested. Put on trial. And it was a trumped-up charge. of seven years transportation in Australia. Why Australia, why not here? It was Britain's dumping ground. or poaching were dispatched to what would have been a life sentence. Cos very few people could ever afford to come back. chains from Dorchester to the prison hulks in Portsmouth Harbour. They were kept in dreadful conditions. And the poor conditions made George Loveless ill. He eventually was transported later. on it, was written the famous poem that we still recite about liberty. "We claim the birthright of our sires." And the famous section at the end. "We will, we will, we will be free!" on their long voyage, the public were responding to their fate. around the country realised this was a challenge to their very existence. Even before they had got going. meetings in Huddersfield, petitions from Cheltenham. the like of which they had never seen before. of an 800,000-strong petition to Parliament. -So many people for six farm workers? and marshal such a large number of people is astonishing. And you can understand why it really did frighten the government. the martyrs' families, legal and political challenges were pursued. first pardoning the martyrs and then bringing them home. They must have come back as heroes. They arrived in Plymouth, in triumph. And unions recreated this grand march. and the freedom to organise people at work. Now, where has Raj's rival got to? Hamstone of nearby Ham Hill. -Hanson, the name's Hanson, yeah. Charles. -What a fantastic centre you've got here. It is certainly big. Almost 100 traders. But Charles doesn't really need an awful lot more. There must be plenty squirreled away in here. What really excites me is this dish down here. This little, octagonal dish is hand-painted in blue. But actually, it's also gilt outlined. It's not minging. OK, it might be because it's broken. But in fact, this is Ming. This is true Ming porcelain. Made pre-1644. And it could be yours for 500 pence. Astonishing. Almost 400 years old. We've got some English Staffordshire porcelain circa 1820. Some Chinese Qianlong cups from circa 1780. Some small Kangxi Chinese dishes from 1700. And then, almost rolling home, we have a Derby dish here. And what I'm really tempted to do is grab him. and then maybe put the Derby dish in there as well. for a right old good price. And if I can do, I think this little lot here has real Eastern promise. So is that including East Midlands promise? Ha! Time to have a word with Anthony. -I've been digging. Anthony, take a seat. -What have you got here? This ensemble just oozes probably 300 years of history. Five, two 12s are 24, 45... That's £50, isn't it? Yeah. Yeah, I mean, I was hoping £25. 30 quid and it's yours. -I'm OK. I'll take them. Thank you so much. He did rather well with a similar assortment last time. Providing he can get this to auction more or less intact. takes our trip to beautiful Bridport. -Hello, Bill. Nice to meet you. And? -What a lovely little shop you have here. so I reckon he might be a wee bit cautious here. Not bowled over. Ho-ho. Who writes this? I've seen a brass ladle over there. It's a 19th-century English brass ladle. Used for serving soup, sauces. It might even have been locally made. A lot of the local forges made them. this will go with my other spoons. I do like this, Bill. It's quite nice. It's got copper rivets. -Yeah, it is nicely made. -What's the best you could do on that? -The best I can do? -Um, I'll do that for a fiver for you. Swift, Raj. Anything else catch your eye? I know they're not very old. These Regency-style wall brackets. But I do like them. They are saleable. there's always a market for them, at the right price. -There's £35 on the ticket. -What could you do them for? -Oh, I think we could do them for 15. -You need some help, don't you? -I do need some help. -Believe you me, I need lots of help. -And you're happy with that? Let's shake hands on it. Thank you very much indeed. Five pounds for the ladle. And 15 for the brackets. I've just remembered, actually, I know you said you've got spoons. We've got another spoon that you might be interested in. Didn't cost us much and I could throw it in for a couple of quid. -You sure you're happy with that? I think it would go nicely with the others. -I'm not going to say no to that. Thank you very much. So, £22 for another little pile. and take a look at what's been bought. and a mannequin in armour. some spice drawers and some wall brackets. So, what do they make of each other's items? Be honest. I love the spice drawers. I think they might make £100 on a really good day. The knight's costume. What do I call him? I just hope he gets knocked off his horse on this one. and that will make the competition bubble and become quite volatile. Would I rather have Charles' items or mine? I'll stick with mine any day of the week. for an auction on the edge of the Somerset Levels, at Bridgwater. Are we not far from Cheddar Gorge? that's always been the industrial heart of Somerset. At Tamlyns, established in 1878, business is brisk. But what does the auctioneer, Claire Rawle, make of our lots? paired with the Victorian silver belt buckle. Very, very bizarre. Haven't seen anyone trying it on yet. There's a wave of enthusiasm. Can you feel it in the air? Especially as your repro Georgian brackets are first. -These I have to start at £30. £30. Do I see two anywhere? -At 30. All quiet in the room. At 30. At 30. Come along. 32. 35 with me. Can't lose them for that, can you? 38? They're worth it. They're ever so pretty. They're going to sell here with me then at £35. That's very good. Well played. Yes, doubled your money and more. Now for Charles' combination lot of implements and box. I'll start this one away at £30. Here at £30. -Do I see two anywhere? -At £30 now. Two. At 32. Oh, go on. Treat yourself, Jed. At £38. Bid at 38. Now 40. £40 I have. Fresh bidder at 40. Are you sure? At 40. I have straight ahead here. At £40. It's going to be then. You all done? Followed by the tureen they both wanted, but Raj came away with. I have to start this straight in at £12. £12. Do I see 15 anywhere? At 15 at the back of the room. -You sure? At £28 here. At 28, it's going to be. You all done? Yes, another profit served up. Time for a bit of Victorian high fidelity. I reckon it's worth at least £30. That makes a loss cos it cost me 40. £50 straight in please. £50. 50? -Start me somewhere. Thank you. 50 I have. Do I see five anywhere? Five? Don't miss it for... 70. -It's playing sweet music in Somerset. -Gosh, it worked well for you. With its horn, it might have done even better. What will they make of Raj's Doulton? 20 surely to start me. 20? 20, surely. -Who is going to start me? -Eight. At eight pounds. Ten. Are you sure? I've got 15, 18. 20. At £20 then. At 20. All done? It's going to sell then at £20. What a bargain. You got a bargain there. Now for Charles' slightly chipped porcelain pile. Featuring a bit of Ming. £20 straight in for it. 20? OK. How about ten pounds straight in? Ten I have from the hand at the back. Ten pounds. At 12. No? At £28. At 28. Now 30. It works. Every time you ask for one more, someone puts their hands up. -Get it down. Get it down. After auction costs, it actually results in a bit of a loss. Come on, Bridgwater. You have a certain honour to keep up here. Nobody? Where are you going to start me, then? Ten pounds. -Oh, everyone wants it now. He was first. Ten. 12. -15. Here we go. 18. -22. Oh, my goodness me. -One more, one more. I haven't finished yet. -At 28. Are you all done now? It's going to sell at £28. We've still only had one loss so far. But Raj is not going to catch Charles at this rate. Even though he is having second thoughts about these. I may have made a mistake with these pens. You think the writing is on the wall? -And I start straight in. I've got £55. At 55. Do I see 60 anywhere? Bids with me here at 55. -At 55 for the fountain pens. No? Bids here with me still. Are you all sure in the room? It's going to sell it here at £65. No need to worry there, was there? Now, can Raj's spoons plus his bargain ladles scoop up a profit? £20. Nice early brass spoons. £20? They are going to bomb. They are going to bomb. Ten surely somewhere! Ten pounds. Ten pounds I have. At ten pounds. For the nice, early spoons. 12. 15. At 15... Are you sure? That was short and sweet. -Oh, stop it. You and your profit. All done? It's going to sell then at £20. No, it's definitely a loss. -I can't look at you. I can't. Next, it's Charles' slightly odd lot of candlesticks and fork. Ten pounds anywhere for them? -Thank you, ten I have. At ten pounds. Do I see 12 anywhere? -That's good. You've done well. At 25 right at the back of the room. -You're out not. You're all sure? -25 it's going to be. Yep, they just made it. those spice drawers will have to make a pile. I've got a bid of £20 on them. 22. 25. 28. -50. Five. 60. Five. 70. You have put me off. -70. Five. 80. Five. 90. Five. I've got £130. 140. 150. 170 there. At £170. Are you all done? Are you all sure? Raj could win this auction. It all comes down to Charles' final lot. Mannequin, armour and belt buckle. Start me straight in at £30, please. 30 anywhere? Surely! Thank you, 30 I have. 32. 35. You are away, you're away. 55? No. At 55. Still the gentleman at 55. -There you go. Stop worrying. -Go on. Don't miss it for five. At 100. See, it's done the trick. At 100. It's going to sell at £100. Good profit to end the day. leaving him with £414.86 to spend next time. After paying auction costs, he made a profit of £53.60. So, clock this, he won by £1.78 and still leads over all. Ha! It's exciting. It's like land ahoy, or antiques ahoy. Veteran Charles Hanson is halfway through a week of adventure with new recruit Raj Bisram. The duelling auctioneers travel through Dorset and Somerset before heading for an auction in Bridgwater.